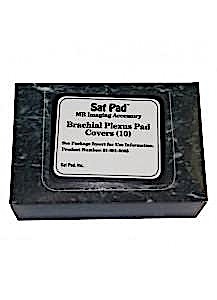 SatPads are a magnetic resonance imaging accessory designed to improve the homogeneity of the local magnetic field by eliminating air/tissue interfaces, thereby improving images from such pulsing parameters as chemical shift fat saturation and gradient echo. SatPads also serve as a comfort pad or stabilizing device to reduce motion artifacts. Comfortable and stabilizing, SatPads reduce motion allowing the patient less time on the table with clearer images. SatPads eliminates repeat scans and manual fat sat techniques thus saving time with increased throughput and patient comfort. Save 3 to 6 sequences a day with SatPad. At 10 minutes a sequence this would save 30 to 60 minutes a day or 5 hours per week. Five additional patients per week at 0.00 per scan would mean 00 additional billing per week. Or an additional 4 FTE hours saved a week with better images and more accurate readings. SatPad Breast Imaging Kits were developed to deal with specific problems associated with fat sat and contrast issues in breast imaging. Kits have been developed for 4-channel, 7-channel, 8-channel, and 12 channel coils. The pads contain a perflourocarbon fluid that contains no hydrogen atoms and has magnetic susceptibility similar to that of human tissue. They will contribute no signal to the MR Image.